This home was built in 1995 with standard builder-grade materials. It had white vinyl siding, a standard front stoop, and an asphalt driveway. I was contacted by the owners at the end of 2015 because they were trying to decide whether to sell their existing home and buy a new one, build a new construction home or remodel their existing home and stay there. We spent nearly four months going over the options. Ultimately, the owners decided that they really liked where they lived, but they just were not satisfied with the look of their home. 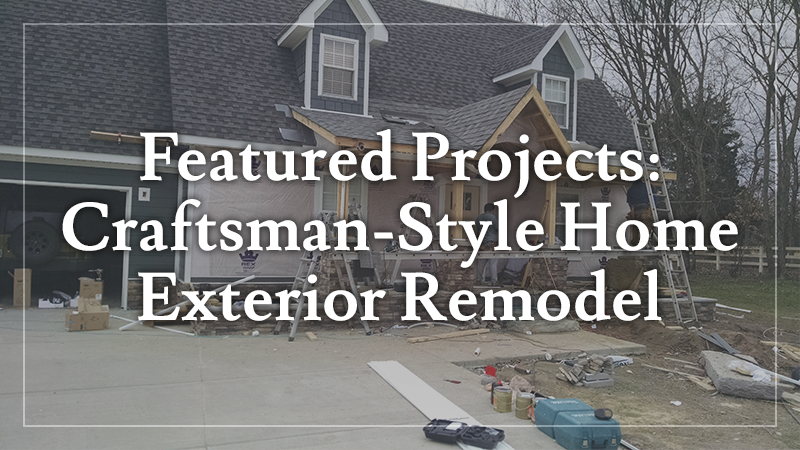 Having made the decision to keep their house and to live in it for the unforeseeable future, the owners decided to give the exterior a major facelift. They wanted low maintenance materials and a Craftsman style look. We started by tearing out the old asphalt driveway and pouring a new concrete driveway that was approximately double the size of the previous one. We marked out the outline and had them park their vehicles in the area to ensure it was just the way they wanted it. Our team then set the forms and poured the new 2200 square foot driveway. Next, we designed and measured a new front porch. Their stoop was a 5×5 covered front entry, and they wanted a larger space to sit and relax. We extended the porch to a 24×6 front porch with a standing seam metal roof. The floor of the new porch was done in a flagstone, and the steps up to it were solid natural stone steps that had to be cut and chiseled to have them fit the way we needed them to. The ceiling was done with a PVC bead board with a nice barrel vault front entry. The ceiling was lit with recessed lighting and a nice pendant light above the front door. To really make the front porch the centerpiece of the house, we changed out the front door and added new tapered columns with rock bases. We then installed new rock along the bottom of the house to really get the feel they wanted. After that, the team removed all the vinyl siding and installed all new pre-colored Hardi brand lap siding. Pre-colored Hardi comes with a 20-year paint warranty, and its fiber cement material helps prevents rot, weather damage, and termite infestations. We accentuated the front dormers and the front of front porch dormer by using a fiber cement shake. Throughout the course of the renovation, we added a lot of custom touches to meet our client’s needs. 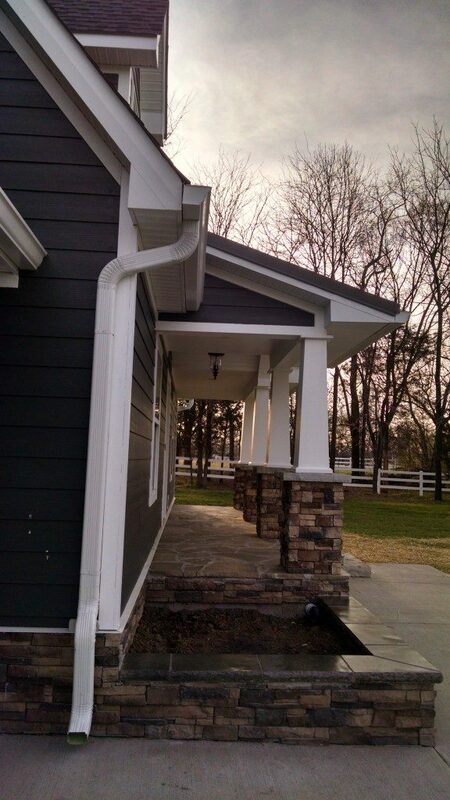 The front downspouts were built into the brand new front porch columns so that they are completely hidden from view. We also installed a new mailbox to match the columns on the front porch. 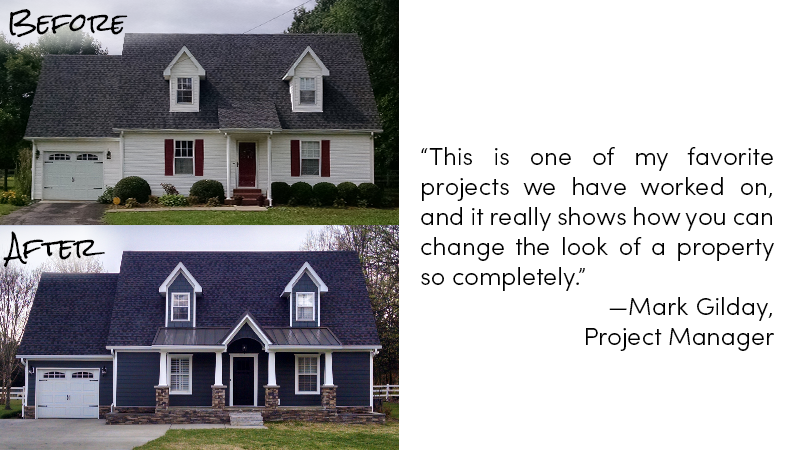 This is one of my favorite projects that we have worked on, and it really shows how you can change the look of a property so completely. If you’re in the market for a contractor who can turn your dream home into a reality, call L & L Contractors. We only hire the best team members, so you can feel confident knowing that you’ll get high-quality results. Contact us today to get started on designing your dream home.